How to Retire Early and in Style--Without a Fortune! If you’ve ever worried about retirement—like whether you’re saving enough or how to retire early, you’re certainly not alone. If your income is less than it used to be, you’re trying to put kids through college, you got a late start investing, or your retirement accounts have shrunk, just the thought of retirement can be stressful and depressing. But the exciting news is that you have more options and control over your future than you may realize! You can have a rich and happy retirement even if your budget and portfolio value isn’t what you hoped it would be. Option #1: Downscale your life and cut your living costs now. The first way to start putting away more for the future is to radically cut your expenses. I’m not talking about slashing small costs like lunches out or gym memberships. While cutting those expenses can add up over time, to really move the needle on retirement savings, consider where you can make the biggest financial changes. For most people, housing is our largest expense. Downscaling to a less expensive apartment or home can be the ticket to freeing up the most money for retirement. Instead of placing so much importance on having a big house or maintaining a big yard, consider how your money could be used instead to enjoy life and start doing what you really want to do. As a side note: If you’re in a home that you can’t sell because you owe more than it’s worth, immediately contact your lender to learn about programs you qualify for to refinance or modify your mortgage. That can improve your financial situation by reducing your monthly payment or total mortgage balance. Option #2: Relocate overseas to cut costs and even upscale your life. If the thought of downscaling is too upsetting or disappointing, you can maintain your lifestyle—or even upscale it—for a fraction of the cost if you’re willing to relocate outside the U.S. There are many beautiful places in the mountains or by the sea where you can live like a celebrity on half or a third of your current expenses. The move could be a short-term adventure or a permanent solution to retire early while working less. Depending on your work, it might be possible to keep your job by doing it remotely. Or you could or create a business or do freelance work that allows you to work anywhere with an internet connection. Plus, there are always local job and business opportunities for English-speaking residents overseas. If you’re willing to think creatively, just about anyone can retire earlier than later. Option #3: Retire overseas for a fraction of the cost in the future. Many retirees leave the U.S. because you can enjoy luxuries that may be too expensive at home—like a daily housekeeper, regular dinners out, and travel—for a fraction of the cost. You can live extremely well in many places on a meager Social Security income. Or like a rock star if you have a middle-class budget! More than half a million retirees are already living around the world in places like Belize, Mexico, Panama, Nicaragua, Thailand, Argentina, Chile, France, Italy, and Spain, where they’re enjoying comfortable or luxurious lifestyles that cost far less than they would in the U.S. If the idea of retiring at a younger age and living well for much less overseas appeals to you–start doing a little research. If you’re open to new experiences, I promise that you’ll find a refreshing, new look at your future. The best resource for getting exposure to retirement havens that offer the best value in terms of cost, culture, health care, taxes, and overall lifestyle for your money is the Overseas Retirement Newsletter. 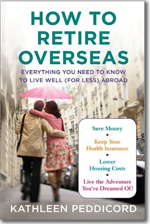 It’s published by Kathleen Peddicord, an overseas retirement expert and author of How to Retire Overseas: Everything You Need to Know to Live Well (for Less) Abroad. The newsletter gives you actual costs of housing, utilities, food, entertainment, and much more information about the world’s most affordable, safe, and beautiful places to live. You’ll also learn how relocating overseas can help you avoid taxes, get incentives for starting a new business, and afford the best health care. Though I’m years away from retirement, I love keeping up with all the sunny, exotic places where both young and old retirees can live in luxury on a budget. And I plan to start taking trips to some of the best cities now, so I can explore and get a feel for whether they’re right for me.